We read a lot of books in our home, and each year I gear our read-alouds to the period of history we're studying, often using historical fiction to enhance whatever we're learning about. This year it's The Mystery of History Volume III, which means we'll soon be coming to the birth of America and our first president. 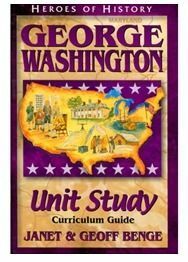 YWAM Publishing's book covering the life of George Washington for children (George Washington: True Patriot) was a perfect fit to review for The Old Schoolhouse Review Crew. 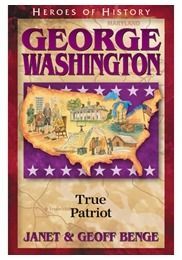 George Washington: True Patriot is part of YWAM's Heroes of History series, and it's a great little read. Starting with George's childhood, the book is light and interesting but doesn't skip the highlights of George's life, including his military service during the French and Indian Wars and of course, the Revolutionary War. It follows our first president's delve into politics with the start of a new government, his term as president, and eventually his life after service to his country and his death. Geared toward the 10-and-up crowd, my 9-year-old read this with ease. If you have younger kids or middles who aren't strong readers, George Washington: True Patriot would make a great read-aloud. It's written with a cheerful tone, is funny in spots, and is memorable. But the true prize here is the Unit Study Curriculum Guide. Honestly, I have never seen a more thorough unit study than this one, and because I didn't know YWAM published these alongside of their educational series, I am so glad I was introduced. I will definitely pick more of these up as we add additional Heroes of History titles to our home library. What makes it so great (in my opinion)? There are comprehension questions for each chapter that cover vocabulary and facts. There are essay questions, creative writing prompts, hands-on projects, audio/visual projects, and arts and crafts, too. Of course, all of these activities are suggested and are optional, but having a list to choose from is nice; use what works for you and ditch the rest. Also included in the Unit Study Curriculum Guide are social study skills focusing on places, vocabulary, geographical characteristics, and a timeline. There is also a very nice list of additional resources, including videos and books. I actually purchased a recommended video on the list for my little guys because I know it will be a helpful tool for them. I received both the book and the unit study guide in a pdf format and then easily uploaded them to my Kindle Fire. However, you can also purchase them as a hard copy, or as an ePub or Kindle.mobi. They are priced right at 7.49 for the unit study and 6.99 for the book.